Add beauty and comfort to your yard or patio with the Amish Poly Curved Back Glider. Constructed of durable, eco-friendly poly lumber, this rocker will last decades without the normal maintenance and refurbishment required from wooden outdoor furniture. 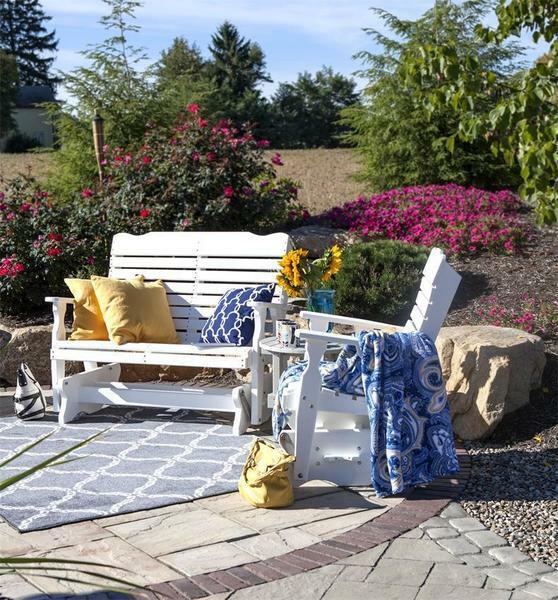 From your favorite garden seating area, to the porch or patio, this quaint poly glider bench offers a beautiful look that will help you get the most from your outdoor decor. Each glider bench is available in an array of solid or two-tone poly colors, giving you a variety of options to get just the right piece to compliment your outdoor space. Add one or two optional cupholders for an easy way to rest your favorite drink as you relax and enjoy every amazing afternoon this season. Stays beautiful for years and years. No fading, rotting, splinters, splitting or cracking. Multiple colors to choose from, or select two for a two-tone look. Comfortable seating and always smooth to touch. Lower cost per year without regular maintenance and refurbishment associated with wood furniture. This outdoor poly bench is built by Amish woodworkers with a careful attention to detail and a commitment that reflects time-honored traditions of integrity, simplicity and hard work. With our poly lumber outdoor furniture, you receive solid quality and attractive design. In today’s busy world, the Poly Curved Back Glider helps you create valuable leisure time for you, your family and friends. And, it's backed by a 20 year warranty for residential use, so you can count on this beautiful glider to be ready for anything, for decades to come. This poly curved back glider usually ships within 2-4 weeks of purchase. Please call an Amish Furniture Specialist today to help with any questions, request color samples and start your order by phone.